Yoshikien garden is a beautiful Japanese garden located in Nara. The Yoshiki-gawa River, a small river that runs beside the garden is responsible for its name. The garden was built on the site of Kofuku-ji Temple’s former priest residences. Yoshikien garden consists of three separate areas – a pond garden, a moss garden and a tea ceremony garden. 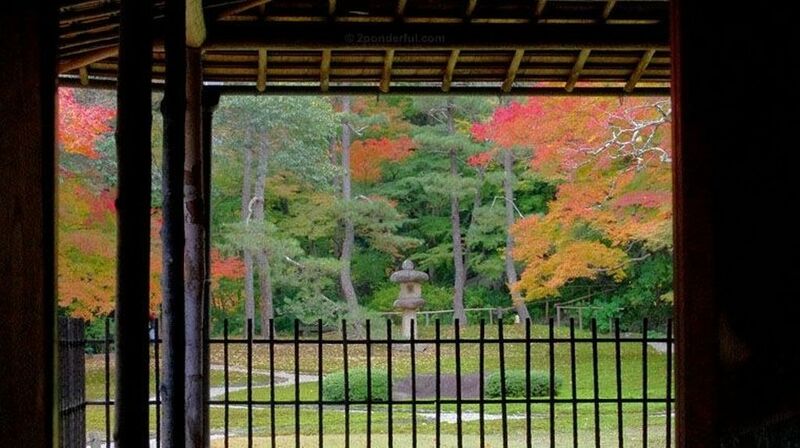 So, visitors can see three different variations of Japanese gardens in one spot and experience the autumn leaves away from most of the crowds. If visitors still want to see more techniques of Japanese gardening, the Isuien Garden is located just across the small river. Isuien garden looks particularly attractive in autumn as it makes use of the “borrowed scenery” of Todaiji’s Nandaimon gate and Mount Wakakusayama. The front garden is from the mid-1600’s whilst the larger rear garden was built in 1899. There are various tea houses throughout the gardens from which to admire the leaves. Both gardens are located in central Nara, a visit to Yoshikien Garden is easily combined with seeing Isuien garden and other attractions such as Todai-ji Temple and Kofuku-ji Temple. Near to the gardens, a view of Nara, Todai-ji, the park and the surrounding area may be had for free from the viewing platform of the Nara Prefectural Office. Hours : 09:00-17:00 (last entry at 16:30). Closed between December 28th and February 28th. Fee: Free for foreign tourists/ 250 yen for Japanese.